Dan Palmer has been studying and practicing permaculture for a little over ten years. Along the way he helped start the now global permablitz movement, a well-respected permaculture design, implementation and education company, and several overseas permaculture projects in India and Africa. 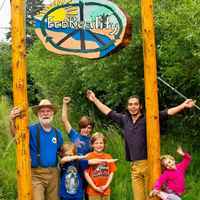 He has taught or co-taught perhaps a dozen permaculture design certificate courses, read and written a lot about permaculture, and learned from many senior designers and teachers within permaculture and in related fields. In the last year he has started running what he calls Advanced Permaculture Design courses, in which he gets to work with folks that already have some training and experience in permaculture (and want to take it to the next level). He also continues to design, with several hundred professional design projects behind him. Whenever you design and create anything, you deploy one or another conceptual framework. One or another way of framing and making sense of both what you start with, how to go about developing or changing it, where you are heading, and why you are even bothering. No matter if you’re aware of your conceptual framework. It is there. Now here’s the thing. Adaptation cannot be fabricated or master planned, period. I believe it to be an essential truth that adapted systems can only emerge or be generated iteratively, in an ongoing dance between a system’s form and its context. Generative transformation is really good stuff. I believe permaculture and generative transformation are meant to be together, just like orchid and wasp, legume and rhizobia, or carbon and nitrogen in the perfect compost. Indeed, I’d argue that generative transformation is in play when any permaculture project really shines. The following diagram is a hyper-condensed summary of over two years, 80 posts and 70,000 words worth of this blog’s assorted ramblings about permaculture design. For those that aren’t aware, Dave Jacke is a world class ecological designer, writer, and teacher. Lead author of the acclaimed two-volume Edible Forest Gardens books, I have long respected Dave’s sophisticated and comprehensive grasp of design process. While he prefers the phrase ecological design process1 over permaculture design process, he unquestionably has helped / is helping permaculture lift its game in terms of a design process that not only starts by deeply tuning into people and place, but embodies the principle of starting with patterns and ending up with details. In this episode Dan Palmer from Making Permaculture Stronger enjoys a wide-ranging conversation with Darren J. Doherty from Regrarians.org. In this episode Dan Palmer from Making Permaculture Stronger enjoys a rich dialogue with Ben Falk from Whole Systems Design. My opinion that the design process at the core of permaculture currently lacks soundness and coherence. As a result, in spreading permaculture (which is above all else a design system), we are unintentionally spreading ideas that are unsound and incoherent. Ideas that will, if inadvertently, undermine the ability of permaculture to deliver real solutions in different domains. To deliver on its incredible promise.